Ever since moving to Chelsea, I have always relied on the Lobster Place in the Chelsea Market for my seafood needs whenever I want to cook. While I could find almost whatever fish I needed there, it did lack one thing – a more proper sit down seafood restaurant/counter with a proper menu. This was a void that Cull & Pistol, which opened earlier this summer by the Lobster Place, filled so well. For starters, the little tiny shop tucked in between the Lobster Place and the Green Table offers a number of fresh oysters as well plump clams. I love to kick off the meal there with one or the other, just a little something light. For something a little more substantial, the soups and salads here are sizable and easily shared. 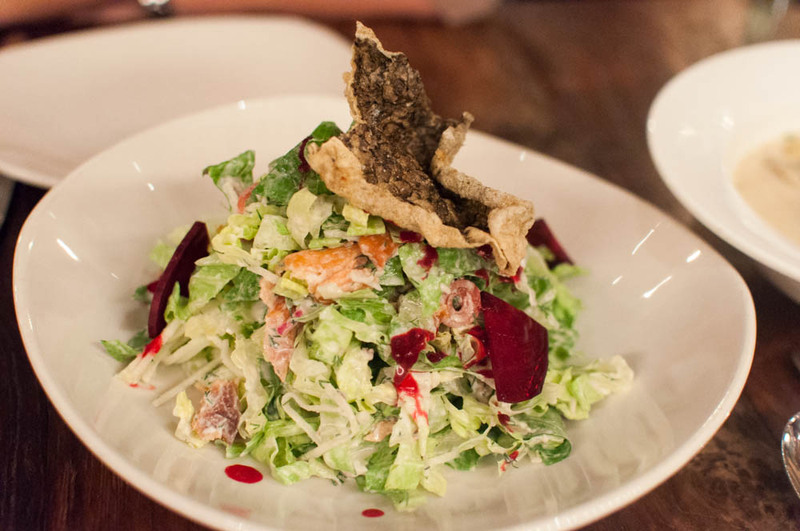 The chopped salad here is studded with smoked trout, green apples and red beets. All of this is dressed up with a horseradish dressing and a crackling of fried trout skin. And what is an oyster bar without a seafood stew? 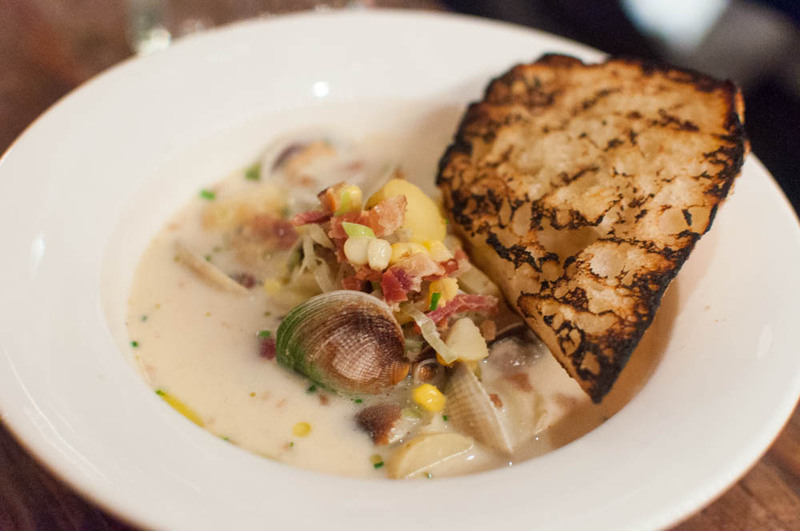 Cull & Pistol has two and their version of a chowder is the oyster and leek soup. Even though the chowder is creamy, the result with oysters and bacon is more smokey and light than milky and heavy. In the appetizer section of the menu, there is usually one crudo. 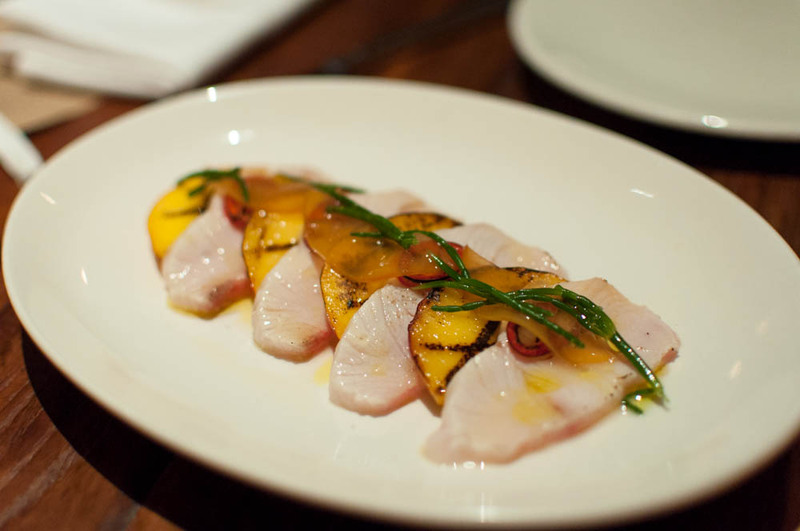 During one visit in late summer, we were lucky enough to find a fantastic crudo of yellowtail and grilled peaches with Thai chili. The combination of the sweet smokey peaches and light lemony dressing with the hit of from the peppers was simply outstanding. The Long Island clam toast is a little more substantial but very messy to eat. 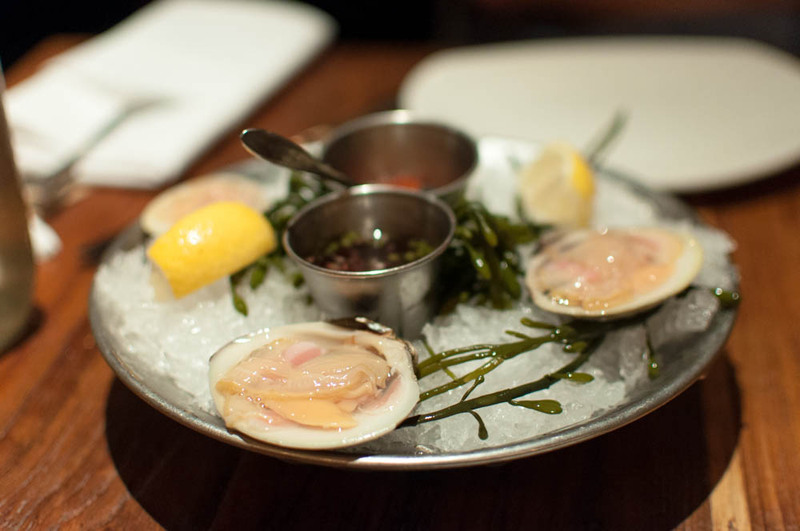 There are plenty of clams studded with bites of salty ham. 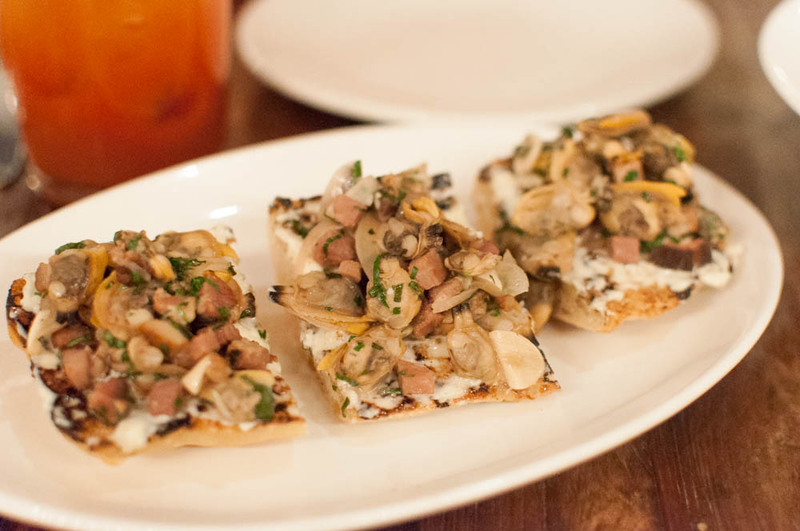 The ciabatta bread is really just a vehicle to deliver the loose clam and ham salad into your mouth. Initially listed under the entrees, the uni tagliatelle has since changed zip codes and landed in the appetizer section. The good thing is that the dish has not changed much, from neither the ingredients to the portion size. That is to say that this is a rather sizable shared appetizer unless you are very hungry, then this would be a sensible entree. 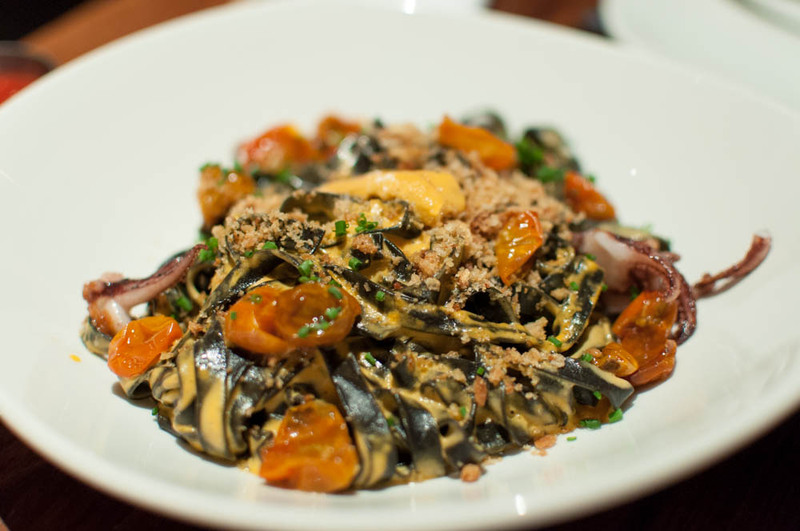 The tender squid ink tagliatelle strands are coated with a creamy thick uni based sauce. The stewed tomatoes add a nice acidity to the rich dish which is finished off with a crunch of bread crumbs. During my visits to Cull & Pistol, I found myself more drawn to the appetizers than the entrees but one that I wouldn’t mind revisiting is the miso glazed hamachi collar. 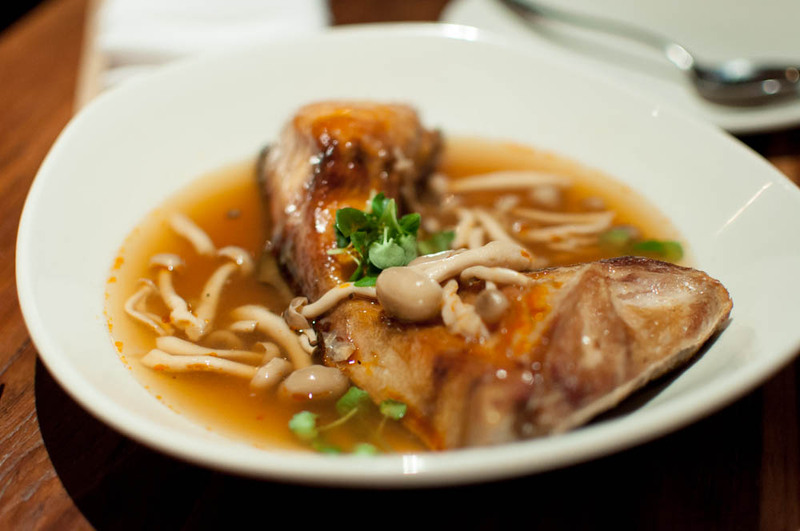 There is plenty of meat on the collar and yuzu mushroom dashi balances out the sweet miso glaze perfectly. 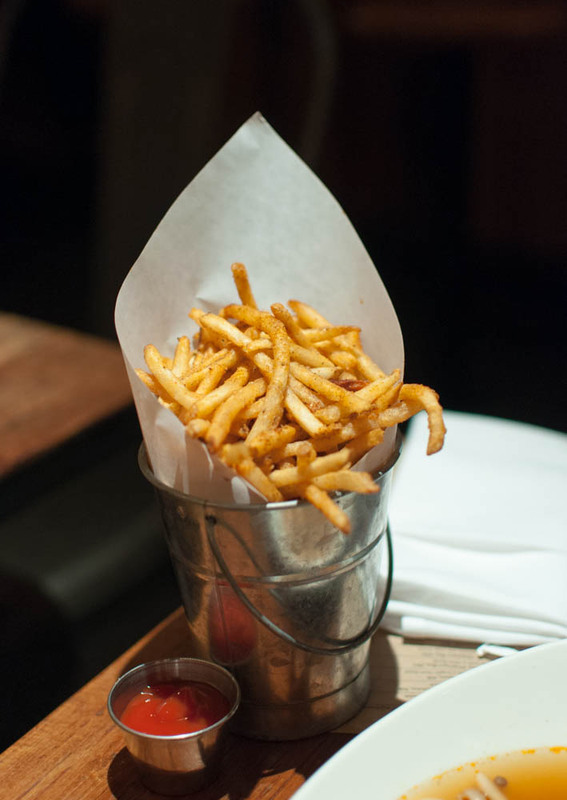 One thing that I have always ordered from Cull & Pistol is their New Bay fries. I am not quite sure what makes them different than Old Bay but they are certainly addicting. Like many of their peers, Cull & Pistol doesn’t offer a dessert menu. Instead, all meals here end with an orange gelato from L’arte del Gelato. 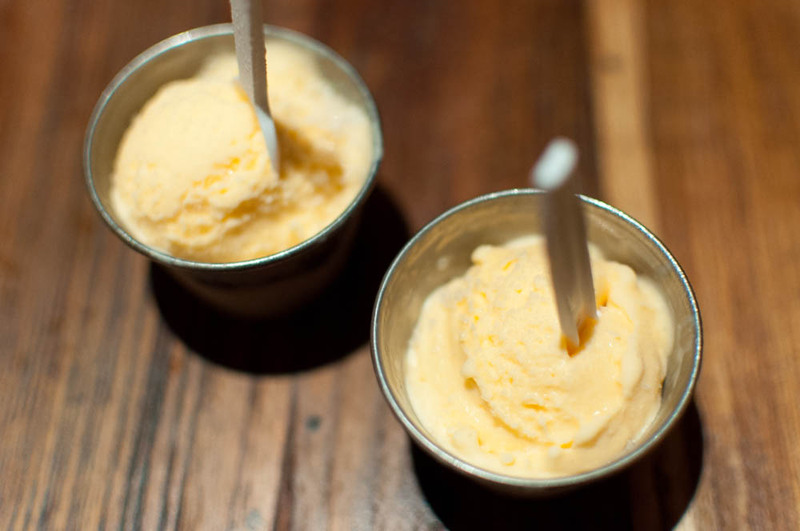 The sweet orange creamsicle gelato just brings back summer memories, regardless of the weather outside. And if one little scoop isn’t enough to satisfy your sweet tooth, you don’t have to wander far inside Chelsea Market for more sweets.